Following amalgamation of the Douglas and Cairns councils in 2008, the Daintree Precinct Working Group was formed by Cairns Regional Council to address a number of long-standing operational issues relating to the Precinct, the Ferry and tourist operations. As a result the preparation of The Daintree Gateway Master Plan commenced. In recognition of the outstanding natural assets of the Daintree National Park and Wet Tropics World Heritage Area, Council has developed a master plan to deliver a sustainable, iconic and world-class visitor experience at its Gateway. The Daintree Gateway Master Plan was embarked on as a means of addressing a number of outstanding opportunities and issues that, when resolved, would provide an improved visitor experience at the entry to the Daintree lowland rainforest in the Daintree National Park and the Wet Tropics World Heritage Area north of the Daintree River. 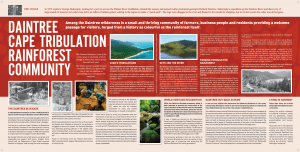 The Gateway enhances the prosperity of the Daintree area by inspiring visitors to take more time to get to know the values and stories of this outstanding natural environment, its traditional owners and the resident communities. Ferry North Bank (where entry to the Daintree rainforest area commences). In these locations, the focus of improvements relate to landscaping treatments and way finding signage. There are also specific improvements planned in each of the Precincts to create the sense of arrival and enhance the experience of entering the Daintree Rainforest through the Gateway. While the Daintree Village sits beyond the scope of works within the Daintree Gateway Master Plan, Douglas Shire Council is amenable to exploring opportunities to continue work with the various organisations and businesses within the Daintree Village to ensure sustainable enterprise and improvements are maintained, developed and enhanced. Through the master planning process a number of economic, environmental, social, cultural and legislative frameworks were explored. 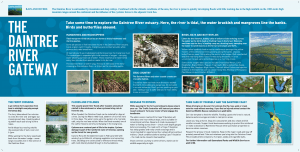 These are detailed within the the Daintree Gateway Master Plan Issues and Opportunities Draft Discussion Paper and the Daintree Gateway Master Plan Vision and Context Paper. 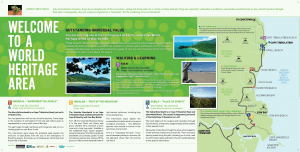 The Daintree Gateway Master Plan Issues and Opportunities Draft Discussion Paper identifies the current issues which affect the Daintree Gateway and highlights the importance of the opportunities which will help to define a memorable experience at the entrance to a World Heritage Area. The report presents background information, identifies issues (in terms of physical character, operations, and legislation and policy) and identifies arising opportunities. 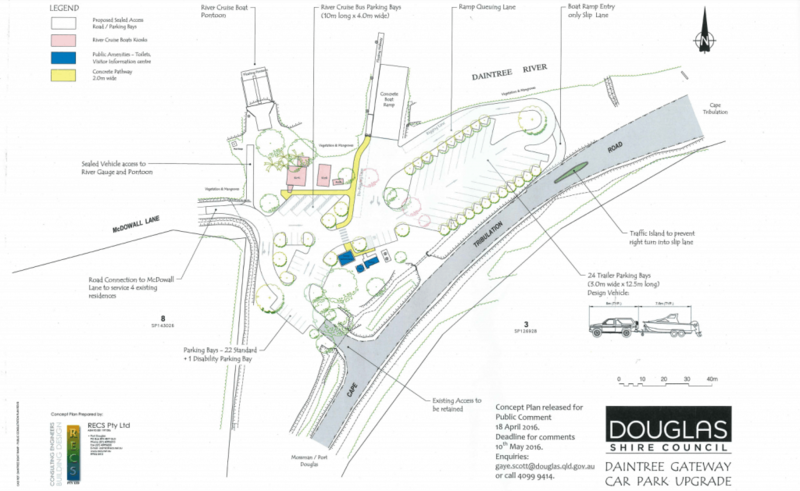 The Daintree Gateway Master Plan Vision and Context Paper documents the information that will inform decision making about project options and outcomes. It documents a clear vision and guiding principles for the project. 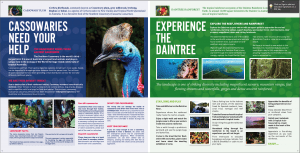 The Daintree Gateway Master Plan Strategic Framework provides an overview of the project framework and the principles for developing a master plan for the Daintree Gateway. A number of options for various precincts were explored with stakeholders. These are outlined within the Daintree Gateway Master Plan Options Report which describes and illustrates a broad range of potential development options for the purposes of community and stakeholder consultation. The report informs the basis of consultation activities with a wide range of community, business and visitor stakeholders to test and evaluate the options and develop a shortlist of preferred options for future development. The achievement of the vision for the Gateway is outlined in the conceptual images and diagrams throughout the Master Plan. Council’s next role is to take the concepts and develop detailed plans for construction, landscaping and infrastructure elements, including monetary frameworks for establishing a program of works over a five to 10-year period. It is envisaged that the implementation of the master plan will be incremental and in line with budgetary capacities to ensure sustainable delivery of the program. Stage 1 of the Daintree Gateway was completed in July 2015 and includes new welcome signage, new indigenous artwork on the ferry, a new interpretive centre, native tropical gardens and amenities block. The $287,000 Daintree Gateway improvements were jointly funded by Council and the State Government with the input of Kuku Yalanji elders and artists and local businesses. A brilliant native tropical garden and welcome sign in Kuku Yalanji language now introduces visitors to the Daintree Rainforest at the highway turn-off, with the drive to the ferry also encompassing several new feature gardens. The new interpretive centre in the boat ramp car park details the history, people, plants and animals of the Daintree while the ferry has been dipped in a kaleidoscope of colour detailing the landscape, rainforest animals, history and people of the Daintree. The next stage of the Daintree Gateway in the next 12 months will include designs for sealing the boat ramp car park, traffic flow improvements and investigating the establishment of toilets on the northern side of the Daintree River. A concept plan outlining further improvements to the Western Precinct of the Daintree Gateway Master Plan was released for public comment. The Western Precinct is the area on the southern banks of the Daintree River, near the river tour operators, boat ramp and floating pontoon. Stage 2 works are aimed at more clearly defining activity zones, improving visitor experience including the provision of additional shade, and improving safety and amenity for public boat ramp users. Council sought public comment on the overall design of the area, specifically on parking arrangements and traffic flows. In order to start the conversation, a Concept Plan was prepared, but it was very much a suggestion only and feedback on all aspects was welcome. The Concept Plan shows the existing location of the river tour operator booths, the proposed location of car and coach car parking, and the proposed location of car & boat trailer parking spots. Council is aiming to finalise the plan by the end of July 2016.